OAKLAND, Calif. (CN) – A prominent baseball memorabilia collector sued bat manufacturer Louisville Slugger, saying the company dishonestly claimed ownership of a bat belonging to one of the great hitters of the sport’s golden era. Mark Roberts, owner of the National Pastime Museum, sued Hillerich & Bradsby – which does business as Louisville Slugger – claiming the company stole a bat formerly belonging to baseball great George Sisler that Roberts purchased at auction in October. The lawsuit was filed Wednesday in federal court. Sisler, known alternatively as “Gorgeous George” or “Gentleman George”, primarily played first base for the St. Louis Browns for a 15-year period beginning in 1915. He actually broke into the major leagues as a pitcher, but his prowess as a hitter meant his manager had to get his bat in the lineup every day. It proved to be a good move, as the native of Akron, Ohio, hit over .300 in his second year in the big leagues and went on to become one of the finest hitters to ever swing the stick. In 1917, he hit .353 and stole 37 bases while hitting .341 and stealing a league-leading 45 bases the following year. But Sisler will be forever remembered for his legendary accomplishments in 1920, which almost didn’t occur because he signed up for the Army in the winter. However, World War I ended in 1918 and Sisler suited up for the Browns that summer, much to the chagrin of pitchers around the league. That year, Sisler accumulated 257 hits, a Major League Baseball record that would stand for 85 years until Ichiro Suzuki broke it by collecting 262 hits in 2004. Suzuki, however, had the advantage of playing a 162-game season, whereas Sisler only played 154. Sisler also hit over .400 in 1920, finishing the year with an astonishing batting average of .407, after hitting .442 in August and .448 in September. In 1922, Sisler hit over .400 again, this time hitting .420, the third-highest batting average for a season in the 20th century. 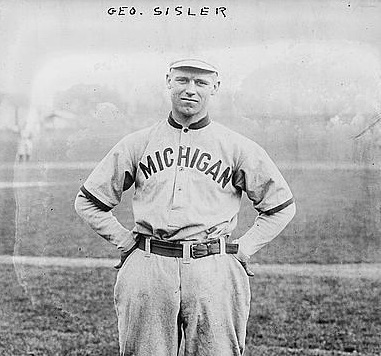 Sisler is one the least famous players to ever hit .400, overshadowed by the brash mercurial personality of Ty Cobb. Also, 1920 was the year that Babe Ruth hit 54 home runs, shattering the single-season record and earning the adulation of sportswriters and the nation. Nevertheless, Gentleman George is well-known among baseball history aficionados, which is why securing his original bat would represent a coup for any collector. To understand the dispute between Roberts and Hillerich & Bradsby, one must go back to the founding of the company. Hillerich & Bradsby’s inception was accidental, according to the complaint, and came about when a young Bud Hillerich played hooky to see his favorite professional baseball team, the Louisville Eclipse, play one afternoon in 1884. At the game, the team’s star player, Pete “The Gladiator” Browning broke his beloved bat, a la the scene from “The Natural”. Back then, bats were not mass-produced, so when a player broke a bat, they had to use another one, one they were less familiar with, which necessitated a change in grip and could affect performance at the plate. After the game, Hillerich approached Browning and said that his father could make him a replacement bat at his carpentry shop. So the pair set off for the shop and worked until late in the night when Browning was satisfied with his new equipment. Soon after, Hillerich convinced his father to begin making bats permanently. The pair developed a reputation for being able to make replacement bats and their business grew and prospered alongside the fledging sport of baseball, which would soon become America’s National Pastime. The method by which Hillerich made bats was to have players send the prototype of their favorite bat, with its particular shape, weight and length. The company would replicate several of them, so when one was broken during play, the player had a ready replacement. Thus, the company accumulated a trove of bats used by some of the great hitters of the game’s infancy. By the 1940’s, the bats were available via model number, so the company phased out the practice of receiving game-used bats by professional players. In the 1980’s, when Hillerich & Bradsby moved its operation from Louisville, Kentucky, to a plant in Indiana formerly owned by the manufacturer of Baldwin pianos, they had a vault of prototype bats, many of which were used in games by some of the great players from the Golden Age. A longtime employee saved those bats from destruction and after a series of transfers they came to be part of a traveling display, shown to those interested in such memorabilia. One of these bats belonged to Sisler and was used by him during the fabled 1920 season. The bat then exchanged hands a number of times, as a series of owners bought and sold it until Roberts bought the bat on lelands.com in 2010. In 2015, Roberts decided to sell a portion of its memorabilia collection through Christie’s, the international fine arts and antique auction house. The Sisler bat, along with nine other items, was sold for a sum of $780,000 on Oct. 19, 2016. But before the sale went through, Hillerich & Bradsby’s lawyers sent a letter to Christie’s saying the Sisler bat belonged to the company and Roberts had no right to reap profits from what amounted to the property of Louisville Slugger. Roberts insists that Hillerich & Bradsby never owned the bat, but only took the bat in “bailment” from Sisler in order to replicate it so Sisler would not be without his preferred equipment during the season. “Hillerich & Bradsby’s assertion of ownership to the Sisler bat was not privileged, as the bat had previously been sold to George Sisler in 1920 and not repurchased, and Hillerich & Bradsby had no legal interest in the bat,” Roberts says in the complaint. Along with endangering his sale through Christie’s in October, Roberts says Hillerich & Bradsby’s unlawful meddling in the transaction has harmed his reputation and wants at least $2 million in damages. A request for comment sent to Wilson, which is Hillerich & Bradsby’s parent company after the two sporting goods manufacturers merged in March 2015, was not immediately returned. Roberts and the other plaintiffs – 33 Collections and the nonprofit 33 Baseball Foundation – are represented by Robert Parker in San Francisco.